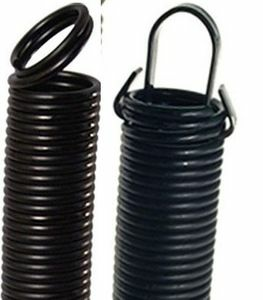 The pull weight of an extension spring is determined by the color code found on the end of the spring. Measure door the height.The Standard height for most residential doors is either 6 ft. 6 inches high or 7 ft high. If your door is over 7 ft. high, call for pricing. Springs are only sold in pairs.If you cannot determine the color code, it will be necessary to weigh the door. 1. Raise the door to the full position and secure. The best way to secure the door in the up position is to snap a vice grip or C clamp under both the bottom rollers. 2. Remove the springs from the door. 3. For a one car opening, lower the door onto one bathroom scale in the center of the door and read the weight. For a double door (16 ft. wide or larger) use two bathroom scales. Locate the scales two feet in from each side. Take the weight of both scales and add together for door weight. 4. Measure door height. Standard height is 6 ft. 6 inches, or 7 ft. If your door is over 7 ft. high, call for pricing.please double check all spring information.A no return policy is in effect on extension springs,all sales are final.NOTE: THE COLOR CODES BELOW ARE THE OFFICIAL DASMA CODES USED BY MOST ORIGINAL MANUFACTURES DATING BACK TO 1990. Spring I.D. By Color code.